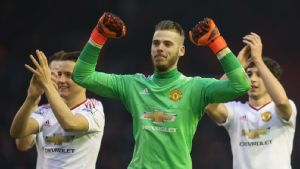 Manchester United manager Louis van Gaal has said his side are still in the race for the Premier League title after their 1-0 win over Liverpool at Anfield on Sunday. United moved into fifth place, seven points behind leaders Arsenal, after Wayne Rooney’s goal secured all three points from a scrappy game. He said the win at Liverpool was “very important” because both Arsenal and second-placed Leicester had been held to draws and added: “The gap is seven points. We can overcome that, so that’s what I’m thinking about. “We have started the year very well, with a lot of wins, and I think this game will give a big boost to everyone in the environment of Manchester United. The manager praised match-winner Rooney, saying: “A striker who scores is always very important, and now he is scoring in [four games in] a row and we are winning in a row. Rooney broke the record for the most Premier League goals scored for one club, overtaking Arsenal legend Thierry Henry. Henry managed 175 goals in 258 games for the Gunners, but Rooney equalled the record by scoring twice against Newcastle in a 3-3 draw in midweek. The England captain has now netted five times in United’s first four January fixtures, and his United career total now stands at 243 goals.